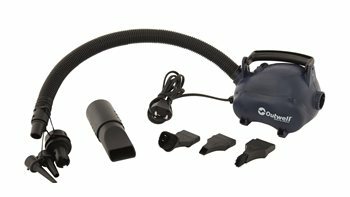 Hurricane Vaccum Pump - it comes with 4 different nozzles and a nozzle for simple vacuum cleaning function. Got this to inflate an Airgo Cirrus 4 tent in a VERY hot climate. Previously, inflating by hand on my own was a nightmare. I tried another electric pump but found that the preset pressure did not allow me to inflate properly. However, with the Outwell Hurricane pump, the tent was inflated, almost fully, in under 5 minutes. While the pump did the work, I was able to get into the tent and hold up the beams so had no problems with the tent falling over multiple times as I had when I was trying to pump manually. I had to finish off with the manual pump just to get the pressure up to the advised level, but this was a minor effort. I also love that this pump is mains powered rather than powered from the car 12V socket which I also found a major disadvantage of the other pump I tried. I haven't tried the vacuum options but as a tent pump I found this very highly satisfactory and look forward to putting the tent up easily many times in the future.